In an effort to reach out to the general public, I'm going to tackle one of my favorite subjects: the concept of Species. Most people outside the field of biology don't realize that this isn't some dry definition in a textbook, but is one of the more debated definitions in the field and changes wildly on context. I'll get started with the macro-biology term (where things make a little sense) and then move into the real fun stuff. "The major subdivision of genus or subgenus, regarded as the basic category of biological classification, composed of related individuals that resemble one another, are able to breed amongst themselves, but are not able to breed with members of another species." So basically a species is a group of organisms that can breed within themselves to produce offspring that can also reproduce. That sounds simple, right? It's not though. There are three major criteria for what can and can't breed. First off, if two organisms do not have functioning biological that connect properly (Tab A into Slot B and all that jazz) then they aren't the same species because they cannot physically mate. A Tree and a Duck for instance. Literally two different pieces of equipment. Second off, if two organisms could breed but cannot genetically produce viable offspring, then they aren't the same species because their genes are incompatible. Donkey and Horse producing a Mule are a good example. Mules can't breed further, and are sterile therefore ending the line. Finally, even if two organisms can produce viable offspring but never encounter each other in nature because of basic behavioural or geographic differences, they are considered separate species. Nocturnal versus Diurnal animals for instance. Also geographic isolation can cause a speciation event if enough difference is generated for one of the first two criteria to take place before they are rejoined. You got that? It's pretty straightforward. Two organisms fit into the same species if they mechanically, genetically, and temporally interact in order to generate more organisms that can also do the same. Really cut and dry. Absolutely nothing that could possibly go wrong with this definition. Well, almost nothing could go wrong with that definition except for humans generating fertile crossbreeds between species... but that's unnatural. Human interaction can overrule the first and third rules of species definition fairly easily. (Physical and temporal constraints are easy enough for our engineering.) But if two genomes don't want to exchange information, there isn't much we can do outside drastic genetic modification. With that in mind, we'll ignore human meddling for defining species. That'll make things easier, right? These are genetically incompatible species we will refer to Normans and Robertas. On the East facing side of the mountain there are a subspecies of Normans called Spotted Normans, which can interbreed with Normans just fine but just have spots. To the Western face, we have Striped Robertas which can interbreed with Robertas, and of course they are striped. On the Northern side we have Striped Spotters, which can interbreed with both Striped Robertas and Spotted Normans. 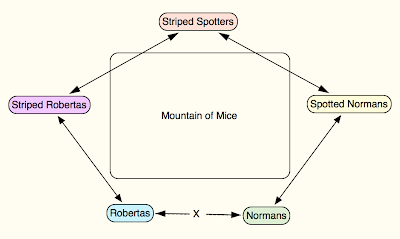 All of these are mice that live on the same mountain, and some can interbreed with others, but not all. What does this mean? 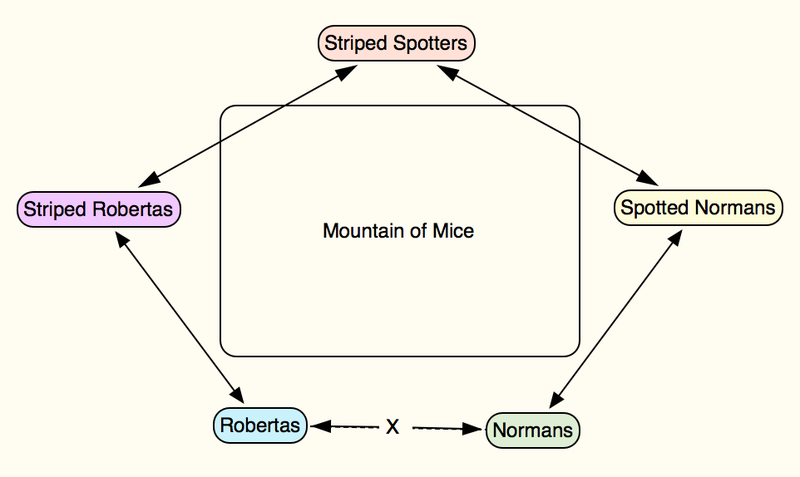 What we have here is two mice species that can exchange genes through genetic exchange (though not directly) and are still considered separate species. What does this mean? Well what you have to understand is that humans created the idea of species. Nature didn't come up with it and it's mostly an artifact of our brand of sexual reproduction needing similar genetic makeups for proper homologous pairing. Ok, here's the fun part. So far we've been going through the species as defined by macro-organisms, specifically macro-organisms that use sexual reproduction. What happens in the world of single celled asexual organisms? No mating. None. So wait, how do we use those three rules for defining species of bacteria, archaea, and asexual eukaryotes? (Those are the domains of life for those that don't speak biology geek.) How do we define E. coli, Botulism, and Lactobacillus as different species? They don't follow any of the rules that we associate with macro-organisms as far as mating goes, and physical characteristics won't always give us clear answers. Instead we use genetics. This means that two strains of the same bacteria that have the same symptoms that are the same species can have drastically different genetic makeups. Mind you, this is 97% of a fairly conserved gene, not the ones that are fairly variable. One human's genome is 99.9% similar to another human's genome. That's regardless of race, creed, or nationality. That's also 99.9% of the entire genome, not just one gene. By the criteria that we have microbial species, if the ribosomal DNA between two organisms has more than 97% similarity, they would be considered the same microbial species. I haven't done the math, but we'd be lumping significant lumps of the animal kingdom in as the same species with these sorts of terminology. Once again, with normal words. Chickens share 60% of their genes with humans. Two strains of Escherichia coli that cause almost the same exact infection had only a few genes in common, but were still considered the same species, and until recently were probably confused as the same strain. This isn't to say that we classify bacteria wrong, but rather they play by such different rules on the microbial level that the terms 'species' don't really apply as we know them on the multi-cellular scale. The term 'species' doesn't even work properly on the multi-cellular scale. Species means a whole lot of different things. All of those definitions are just human words that don't really fit onto the complex concept properly and don't really imply the drastic changes and subtle variances that we see in the world's vast populations of organisms. At the same time, we can't make up a better word for it. It's not a perfect definition, but it's the best that we currently have. To be fair, nothing in biology is really divided. Everything is connected, related, and constantly changing. It's messy, it's life, and it's all we have.